Thousand Creek Gorge, northern Nevada. Hiking in the gorge requires some painful brush busting through head high rose bushes with needle-like thorns and some avoidance of poisonous plants. So overall a good experience with a few small wounds that will heal. Shorts and sandals are out of the question. Some narrow sections are boulder choked resulting in a few murky cascades and pools. Making this water drinkable would necessitate some serious settling and filtering — still questionable in my view so an overnight stay would be hard. Wildlife includes pigeons and raptors so it isn’t always silent as their utterances resonate off the cliffs. A shuttle could be arranged and it can be hiked from either direction. If raining, the roads to the canyon entrances are likely to be wicked mud. Another great thing about this work is the potential for a legacy. The Bureau of Land Management (BLM) in Idaho used my photographs to raise over 33 million in donations for land preservation along the Snake River. 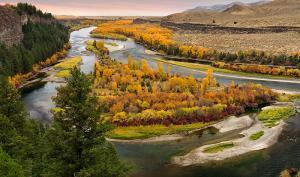 At fundraising events the BLM presented slide shows of my work highlighting the largest riparian cottonwood forest in the west; and sixty miles of the South Fork of the Snake River, one of the most unique and diverse ecosystems in Idaho. This is a good example of the power of photographic art. History shows that artists like Ansel Adams were instrumental in developing an awareness that led to the preservation of national treasures like Yosemite, Teton, Glacier and Yellowstone National Parks. Millions of acres in the USA, and globally, have been preserved following awareness campaigns that included fine art photography. When I first began to get serious about making images of nature, I had no way of knowing how many lives I would have a positive effect on. It feels good knowing that prints of my work hang in thousands of homes and offices and are serving as a calming reminder of the beauty of wild places. This story continues through the books, all of the other printed matter and anywhere else it has been reproduced or featured. 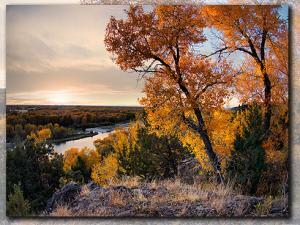 The term for what I specialize in is generally referred to as fine art nature photography. When I'm ask how I got started doing this, I can't pronounce momentous events, sudden inspirations or a mentor experience. I'm not even sure when it was that I first picked up a camera. For me, this experience has been more like a lifetime of learning with dedication and practice. Similar to the commitment required for becoming an accomplished musician, painter, sculpture or a professional in other chosen mediums. 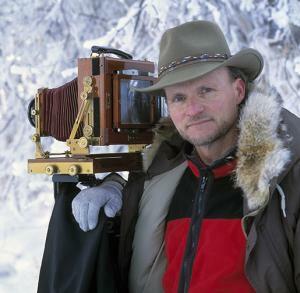 Image of Leland Howard with Wisner 4x5 view camera. Even though a camera is just the tool used in this trade, the question most often asked is "what camera do you use"? So here goes, I've used a lot of different equipment over the years and one of my favorites was a Wisner 4x5 Technical Field. I lugged it around coupled with a wooden Reis tripod for about 15 years. When Hasselblad introduced their medium format D series I made the switch but I don't care much if someone uses an 11x14 view camera or an iPhone, what's important to me is the work. I just choose equipment to fit my style. Black Magic Canyon in south central Idaho. Sad to say some of the formations are now showing signs of graffiti and vandalism. I wonder sometimes if it would have been better to not show any photographs of this unique and amazing place but for the most part - as usual, awareness wins that debate for obvious reasons. I spent more time in a deeper section during this last trip and became aware of something I hadn't fully realized before. Although the dominant colors in the carved basalt are of course black, gloss black and gray, light reflected off adjacent rock reveals different color hues ranging from light blue, to tan and sometimes varying shades of purple. 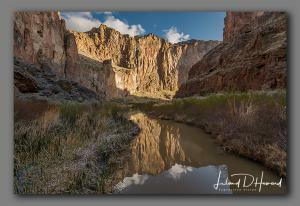 It would take a much better writer than I to adequately describe the color changes depending on the angles of reflected light in this canyon that is an exquisite example of art in nature. 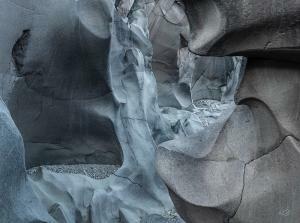 Over a period of about ten thousand years, the Big Wood River carved these sculpted forms in the hard basalt. So, someone in this time comes along and chisels their name and some verbal garbage - I would suggest not doing that. Very Important information if you plan a visit: The water is now controlled by the Big Wood Canal Co. in Shoshone and the canyon is full during the irrigation season so early spring and fall are clearly the best times to visit. If you plan a visit you must call the canal company first. If you are in the canyon when they release water from the dam, it would be like a southwest flash flood in a slot canyon and there would no escaping. The number to call is 1-208-886-233. Montana, east, The famous wild horse, known as Cloud in the Pryor Mountains. 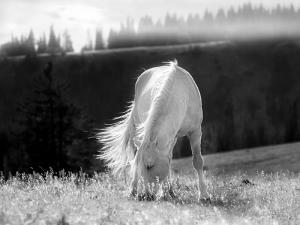 This wild horse, given the name Cloud as a newborn colt by Ginger Kathrens when she did the PBS Nature series, has become kind of famous and his likeness is painted on the walls of buildings in the small towns beneath the Pryor Mountains. He was still an impressive and strong horse in 2012 when I made this image of him. He got very comfortable with my presence in a short time, which surprised me a little. I suspect the legend will live on for quite some time. 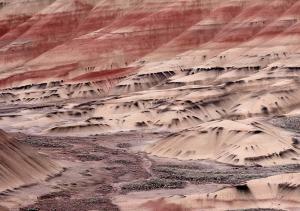 Oregon, north-central, Geological formations aptly referred to as the Painted Hills in the John Day National Monument area. Years ago when I first started displaying images from here, the colors, shapes and patterns seemed unbelievable to some and were at times dismissed as unreal. As the area became more popular, that kind of skepticism has been subdued. Weather conditions, moisture content and of course time of day can dramatically change the tones, color density and hues. This phenomenon can also lead to comments like “I’ve been there and it doesn’t look like that”. The terminology that I like to use is art in nature and in this case, the look is related to geological eras including floodplain deposits from when this region of Oregon was warm and humid. Laterite soil (deposits rich in iron and aluminum) account for the reds, whereas the blacks are identified as lignite - a low-grade coal formed by the compression of partially decayed vegetation (Peat). The other more typical grey coloring is shale, mudstone or siltstone. Then there are the mixtures that vary from gold to yellow and may even appear a light blue under the right lighting conditions. Overall it was a unique set of events that created this magnificent place. Despite possible cultural pressures, one shouldn't be apologetic when enjoying natural beauty as subject matter in an art form. It is an island of respite in a world focused on tragedy. 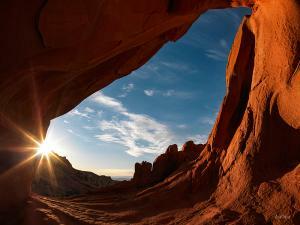 Beauty and nature offer the kind of hope and uplift we need for balance and health. Autumn view from the Cress Creek Preserve. Idaho is my home state and sometimes I can receive a little bereavement from residents when I travel and work in other states or regions. I think for the most part though people do understand what it takes to make a living at this and then of course there is the added benefits of exploration and adventurous travel. Still, it's always a pleasure to represent Idaho when I can, after all it is home and without question, a great place to live. 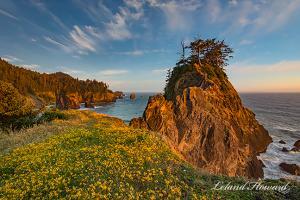 Capturing the grandeur of a large landscape scene can be one of the most difficult challenges. Far to often the magnificence is lost when rendered on a small two dimensional plane. A lifetime is spent in search of ideal conditions along with beautiful light that might, among other things, create the illusion of a three dimensional space. This clearing storm in Zion National Park of southern Utah was just such an opportunity. I refer to it sometimes as the attempt to do a landscape justice. When the conditions are right, everything has to be done correctly in what can be a very short period of time. Over the decades I've missed far more opportunities than I've been successful at. It's the nature of the game and the learning process.